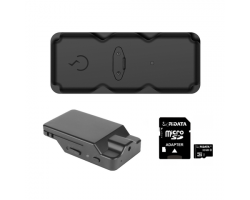 This kit includes the STI_Bolt Asset Tracker for real-time GPS tracking and the Zetta Z12 Motion Activated Spy Camera for home, office, and vehicle surveillance. The STI_Bolt Asset Tracker lets you track a vehicle or an asset in real-time over the internet, while the Zetta Z12 lets you record clear video and audio. You can track the location of a vehicle and record what’s happening behind the wheel at the same time. Perfect for concerned parents and employers, this kit has everything you need when it comes to monitoring your assets on and off the road. The STI_Bolt Asset Tracker is one of the easiest ways to monitor your assets. Just download the app on your Apple iOS or Android device and you’ll have instant access to all your tracking data. You can also access your tracking information on your computer using the SpyTec GPS website. As long as you have access to the internet, you’ll be able to track the device everywhere you go. You can also set up the STI_Bolt Asset Tracker so that you’ll receive notifications on your smartphone or computer as soon as the device logs a new location. The device updates its position twice a day. You don’t have to keep checking the app for updates. Just keep your phone or computer handy and the STI_Bolt Asset Tracker does the rest of the work for you. The STI_Bolt Asset Tracker can go virtually anywhere, so you’re not limited in how you use the device. It’s less than 6 inches long, so it won’t take up a lot of space. The included case features a magnetic mount that easily attaches to the bottom of your car or a piece of equipment. You can rest assured that the device will always stay on target for reliable GPS tracking results. The battery on the STI_Bolt Asset Tracker lasts up to 9 months, helping you track objects for long periods of time. You only have to charge the STI_Bolt Asset Tracker 2 times a year. The device will even alert you when the battery is running low, so you don’t have to worry about losing power at the least opportune moment. Using the STI_Bolt Asset Tracker doesn’t cost a lot of money, compared to other GPS trackers. The tracking service only costs $14.95 a month and there are no hidden fees. You don’t have to sign a contract or pay an activation fee when you start using the device. You also won’t be locked into a long-term commitment, so you’re free to cancel at any time. The Zetta Z12 Motion Activated Spy Camera records clear video and audio, so you can see faces and other important details from across the room. The camera can even record clear video in low light conditions. You never have to worry about dealing with dark or blurry footage if there’s not a lot of light around. At only 3 x 1.7 x .75 inches, the Zetta Z12 is smaller than a deck of playing cards. It goes anywhere undetected and fits into the narrowest of spaces. There are no lights or sounds that could give you away when recording. And with a nondescript black box design, it won’t raise eyebrows even if spotted on a desk at work, in your car or on a bookshelf at home. What makes the Zetta Z12 so adaptable is its wide array of features and recording modes. For vehicle theft prevention, you can place it in your parked car and program the vibration trigger, which will activate the camera if vibration or shaking is detected. Use motion activated mode if you want to monitor your house in case of break-ins while you’re gone. The camera will begin to shoot only when its sensors pick up movement. And with voice activated mode, the device turns on when someone speaks, making it convenient for office meetings. The Zetta Z12 can plug into an outlet for unlimited recording or run off a battery for up to 8 hours when AC power is unavailable. You can also get an amazing 90 days of continuous use out of the device when operating in Super Long standby mode, which means that the device sits idle until you’re ready to record. This makes it perfect for long-term surveillance projects. Time and date stamps on the footage tell you exactly when events happened. With the included 16GB memory card, the Zetta Z12 can store up to 15 hours of video. It can keep on shooting after the memory card has filled up thanks to the loop recording feature, which overwrites old footage. The Zetta Z12 packs numerous features and uses into one compact and covert device, delivering ideal performance no matter what your recording needs are. 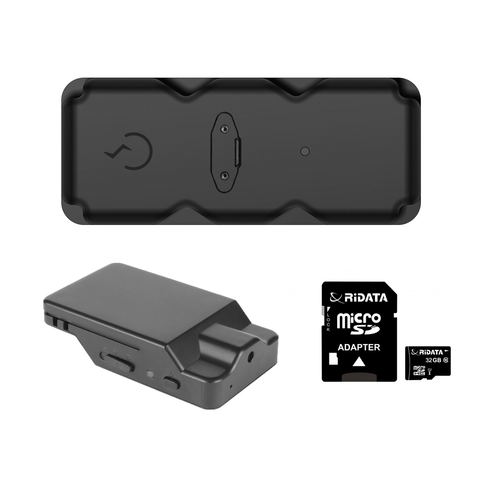 With real-time GPS tracking and video surveillance, this kit won’t leave you disappointed. You can keep an eye on your loved ones or one of your drivers as they take a trip across the country. Protect what’s most important to you with the STI_Bolt Asset Tracker + Zetta Z12 Motion Activated Spy Camera + 16GB Bundle.